Queer people, folks who defy expectations and bring vital complexity to life simply by being, have always existed. In every part of the world, wherever there were people, there were also queer people. How these ancestors are remembered, if at all, is a matter of who is telling their story. Directed by Elizabeth Swanson, I Know My Own Heart is drawn from the life of Anne Lister, an early 19th century British landowner and traveller, and told in her words. It is a ritual of remembering. Adapted by Emma Donoghue from Lister’s encoded diaries, and based on the 1992 publication edited by Helena Whitbread, I Know my Own Heart is a tender and honest portrait of Anne, her lovers, and their lives in Regency England. Born in 1791 to a wealthy land owning family in Halifax, Yorkshire, Anne would become known as “Gentleman Jack” to local residents. Her neighbors described her as “mannish”, and she often shirked gender expectations, wearing all black and owning and operating a coal mining enterprise. Lister’s sexual preferences and relationships were somewhat of an open secret, and she was one of a few notable homosexual women in the United Kingdom at the time. Lister is known to some scholars as the “first modern lesbian”. 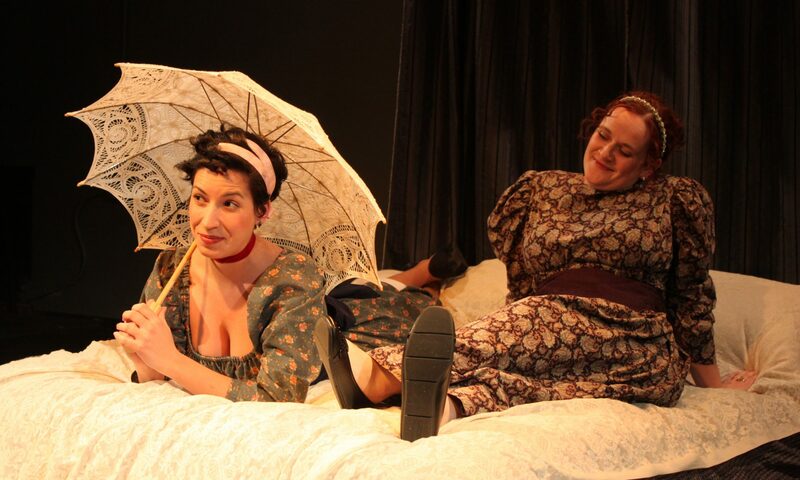 Lesbianism in Regency England was not criminalized to the same extent as homosexuality between men. Yet, women who broke gender rules, were suspected of engaging in homosexual intimacy, or pursued relationships with other women e often ostracized. Relationships between women were often misconstrued as friendships, or even in Lister’s case, as no legitimate threat to heterosexual marriage as it there was no risk of producing an illegitimate heir. Lister’s affair with Marianna Lawton was known to Lawton’s husband, and she even had permission from him to carry on in her relationship to Lister. Lister, due to her considerable wealth and position, was able to remain unmarried to a man and lived her life as a diarist, traveller, entrepreneur, and a woman who had romantic and sexual relationships with women. Director Elizabeth Swanson delivers a poignant and warm tapestry of desire and frustration, moving a text heavy piece with quick scene changes, and clever use of Pride Films and Plays’ smaller space, The Buena. Firmly couched in Lister’s own records, the play unfolds along the relationships that Anne (Vahishta Vafadari) has to three major romantic partners. Tib, played with a wonderful warmth by Eleanor Katz, is Lister’s oldest friend and confidant. Marianne, Lister’s sworn love, is played by an earnest and dynamic Lauren Grace Thompson. Lastly there is Nancy, coolly and confidently played by Jessie Ellingsen, Marianne’s younger sister and Lister’s sexual dalliance. Intimacy Choreographer Sarah Scanlon brought a playfulness and sensuality to the physical relationships of the play, bringing Lister’s rememberings onto our physical plane. Through the highs and lows of the play, the relationships that these characters have to each other crystallize into a complex web of attachment and loneliness. Vafadari’s Anne is willful, tender and focused, and it’s no wonder that she would draw into her orbit the admiration, respect, and desire of Tib, Marianne, and Nancy. The confidence with which Vafadari embodied Anne Lister, complemented nicely by the costume design of Rachel M. Sypniewski, is all the more moving as Anne’s loneliness reveals itself to the audience. The pressure to perform and fulfill the expectations of society can be deeply alienating, especially when an individual does not (and does not want to) fit the mold. Each of the characters in this play grapple with what the world around them demands from them, and though their paths often diverge, they still find love and happiness at their intersections. The talent of the actors was at the forefront of my mind well into the cold Chicago night. The ensemble’s ability to bring their characters to life was arresting, and their navigation of a tricky space and incredible dialect work (spearheaded by Vafadari in addition to her leading role) brought the performance to life. Though I’m not at all familiar with a Yorkshire accent, I was convinced! On the small but mighty set (scenic paint Elyse Balogh), anchored by a beautiful writing desk, all of the elements of this Regency romance come together. Lighting and sound design by Blake Cordell placed us firmly in England’s countryside, and props by Jonathan Berg-Einhorn filled in all of the small details of a romance blooming in secret. Letters, diaries, books, drawers and rings brought texture and resonance to the performance. Sypniewski’s costuming had all of the familiar and beautiful hallmarks of Regency clothing, and made for a faithful imagining. What this production portrays so clearly is the acute pain that comes from living, and loving, in a world that cannot imagine you existing in it. Donoghue has mined questions of erasure, identity, and desire from the story of Anne Lister, someone who perhaps considered herself utterly unique, and therefore quite alone. Swanson and her fantastic team tackle Donoghue’s questions head on with fiery determination, and Chicago is all the warmer for it. I Know My Own Heart runs at Pride Films and Plays through February 10th.